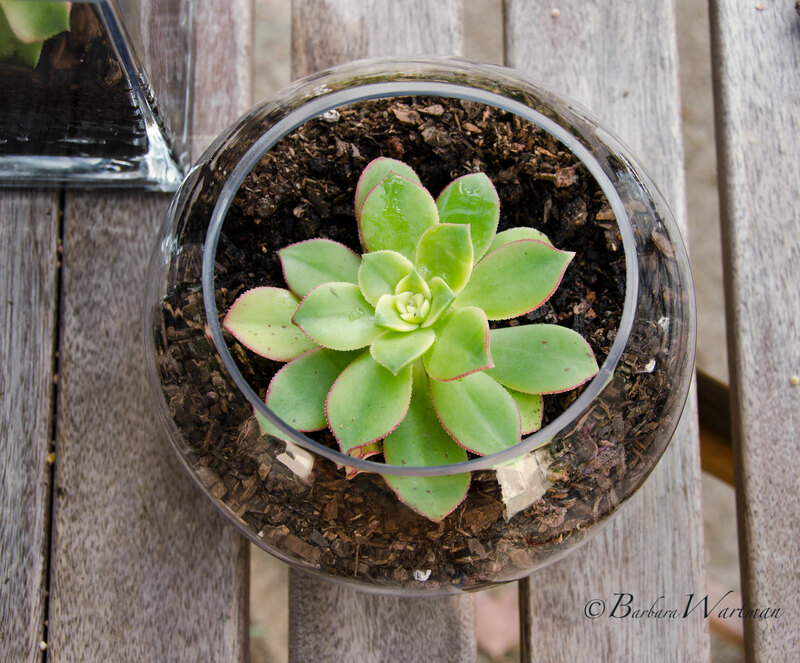 A couple of weeks ago I spent a relaxing, fun afternoon creating a few succulent terrariums for myself and for birthday gifts. It’s super easy and they look really beautiful. 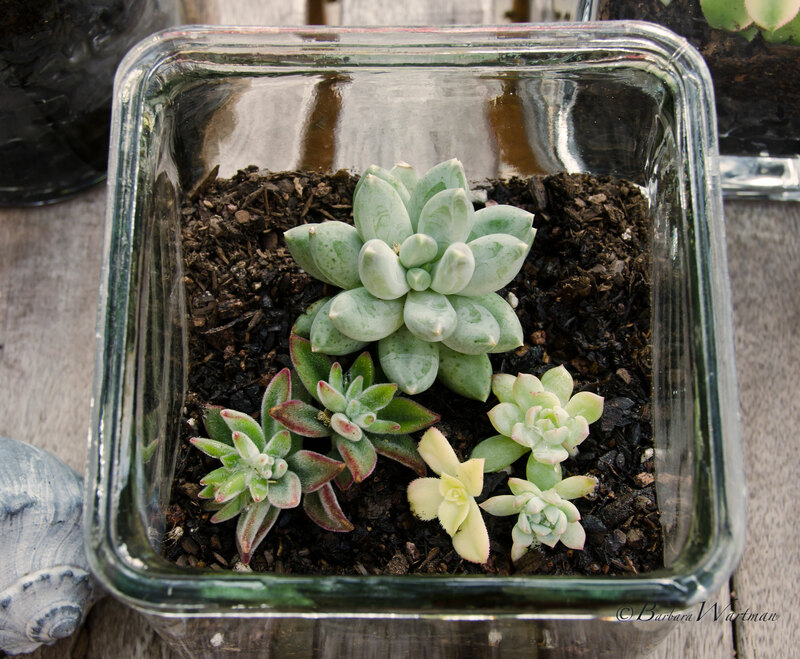 Succulent plants or cuttings. Mix and match different leaf shapes and textures. Small stones — whatever you like. I used small polished river stones. Succulent soil — sometimes called succulent and cactus soil. Or you can use regular potting soil plus a handful of sand. Just make sure the sand is meant for plants. Small shells, rocks or other interesting accent pieces to finish your design. Step 2: Beg, borrow or buy glass containers. Vases, mason jars or any other wide-mouthed container will do. Clean throughly with a mixture of 1 quart warm water and 1 tablespoon white vinegar. Dry thoroughly. Step 3: Very carefully place an inch or two of small stones in the bottom of the container. 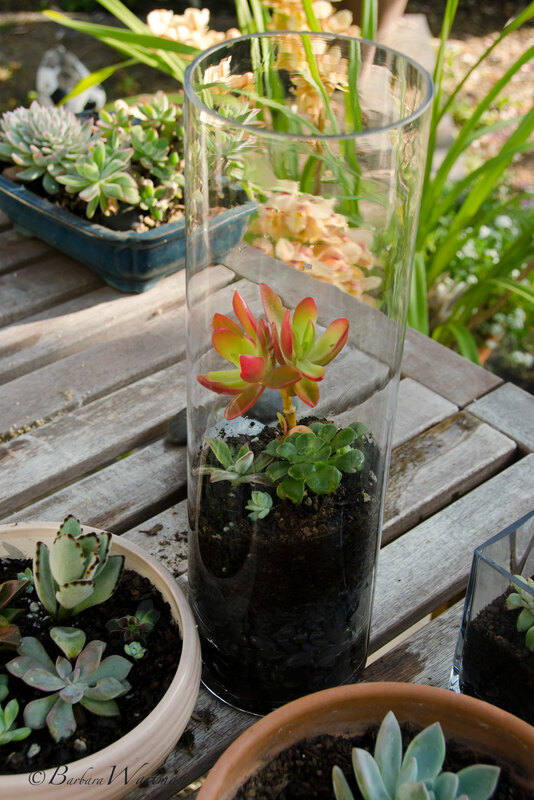 You can use more if you want the plants to be higher up in the container as I did in the tall cylinder pictured below. Step 4: Add a 1/2 inch layer of charcoal. Step 5: Add 2 to 3 inches of soil; more if the rootball of your plant is large. Step 6: Arrange and plant the succulents. Step 7: If you like you can add a layer of sand or stones on top of the soil. Step 8: Add any accent pieces that please your eye. Step 9: Wipe stray soil from sides with a damp paper towel. Use a straw to gently blow away any soil or sand from leaves. Step 10: Very carefully water your new terrarium. Not too much! Stop when you see a water begin to accumulate at the bottom of the container. That’s it! Make sure your terrarium gets partial sun (about 4 hours a day minimum) and don’t water too much or too often — about every week to ten days. This is the one I made for my friend’s birthday gift. I found an orange shell, her favorite color, in my collection and added it to the arrangement. I love this tall cylinder and the red-orange tipped leaves. I also planted some low pots with the extra cuttings I had. Sometimes simple is best. For this small round container one rosette was all that was needed. Here’s another creative idea. 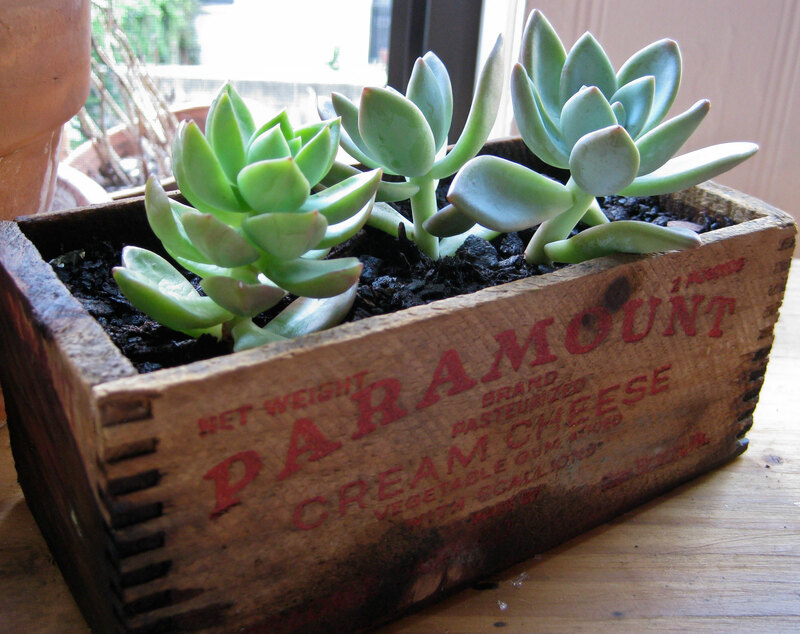 I gave my daughter some cuttings and she planted them in this old cream cheese box. It looks great! 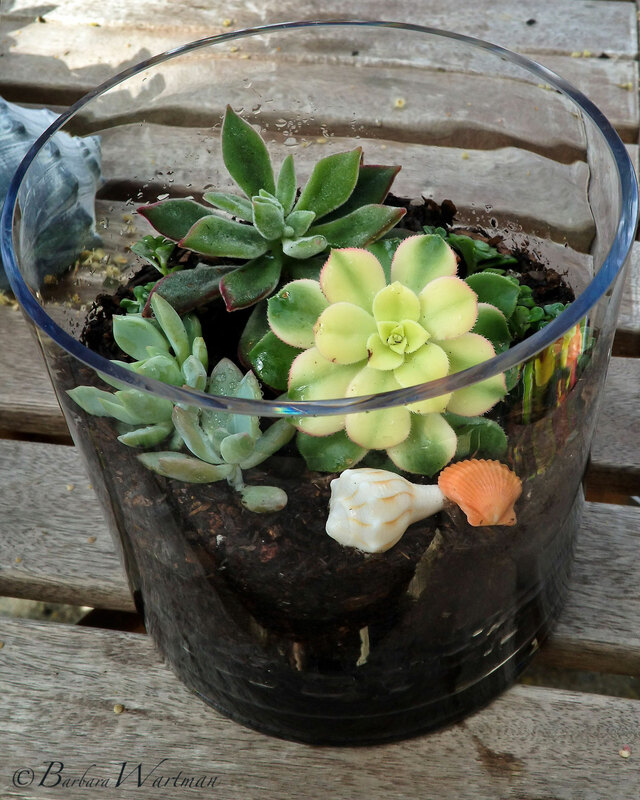 I’ve been totally wanting to make a terrarium and I love succulents, though I only have a few hens-and-chicks in my flower garden. This is the perfect project! These are so beautiful, and such a great idea!